This device allows a person to thread a needle without seeing the eye of a needle. 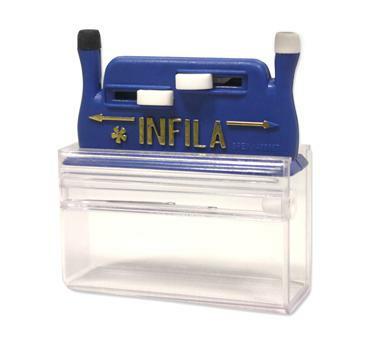 This needle threader comes with two needles but does work with many other needles. The white top is for standard needles and the black top is for for larger craft and darning needles. To test if it works with you needles: place the needle in and slide button across and hold it if you cannot remove the needle then it will work with this device. Inserting the cover backward under the device can help a person with poor grip or strength. Large print, simplified instructions are available upon purchase of this item. Please request these when ordering the item.